This 30-minute recipe is full of bright, fresh flavors and tastes as good as it looks that won’t have you missing any of the carbs. 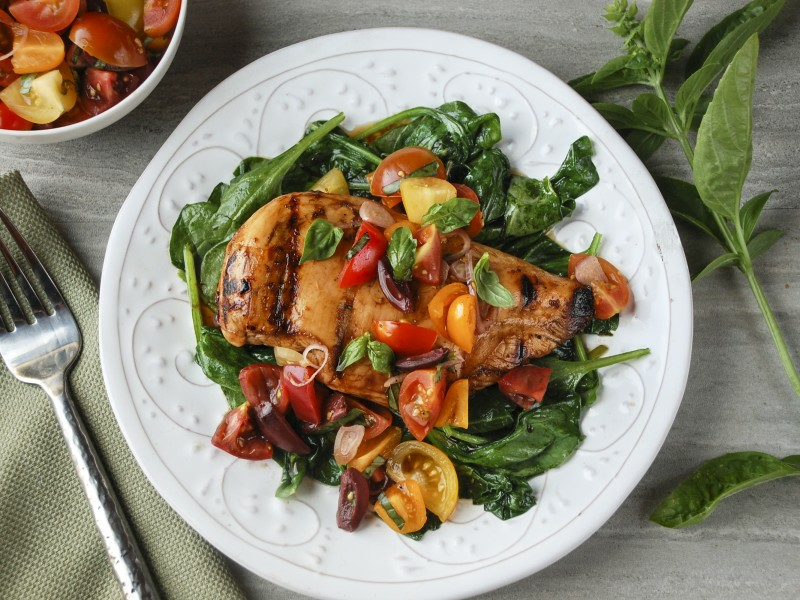 It also takes full advantage of fresh produce using heirloom tomatoes and spinach as the base. The meal is low-carb and surely satisfying. 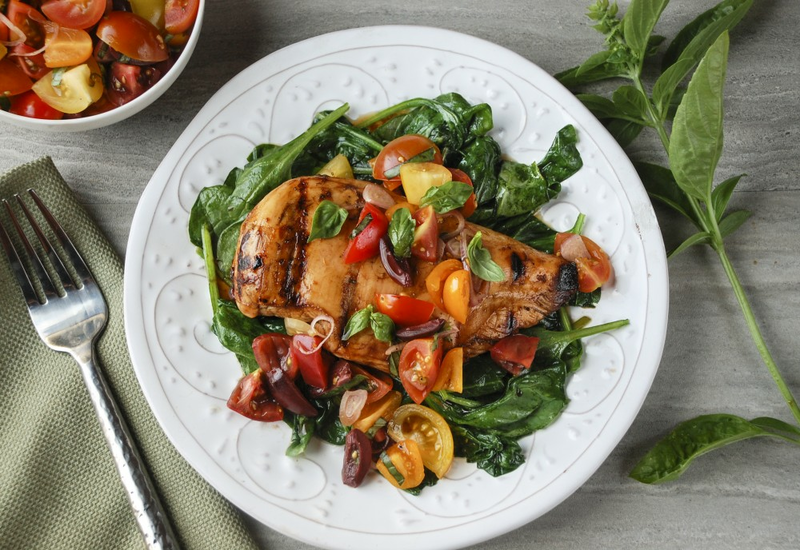 A simple marinade of balsamic vinegar, honey, and garlic flavors the chicken while a dash of orange zest really brightens up the wilted spinach vegetable mixture. This recipe is a perfect summertime weeknight meal, but is nice enough to serve at a casual dinner party as well. The tomato mixture can be made earlier in advance, even as early as the day before serving to help get the dish on the table faster or free your hands for other elements of the meal. Invest in a good-quality balsamic vinegar to keep in your pantry. You won't regret it! Per Serving: 412 calories; 15g fat; 26.4g carbohydrates; 41g protein; 102mg cholesterol; 345mg sodium. Really yummy! I am not the biggest fan of kale, so I opted for the spinach. Loved the fresh flavors paired with the addition of honey. Even though this is a grilled honey chicken dish, I did minimize the amount of honey just slightly. It was still really good. I would like to substitute the honey in the future for another natural sweetening agent for when I start making more Keto-friendly meals. I would have made a glaze or a sauce instead of marinating the chicken with the balsamic because it caramelizes way too much before the chicken is done. this can even be turned into a salad jus by not sautéing the spinach. Pretty good and comes together fast. It needed another flavor to round it out though. Next time I will definitely add a bit of goat cheese. I made the tomato mixture the night before, as suggested in the tip box. It was really delicious, so glad I tried something new. Also, I made the chicken in a cast iron skillet. It was perfect. Instead of serving this over spinach, I decided to use this recipe as my guide to make traditional bruschetta with chicken on slices of bread. Not low carb, but really delicious base recipe, perfect apps for parties.